Journey with Germani! Feel Good Foodies! Here’s another step in my journey to enjoying feel good food, and spreading a little food love. We’ve made it to May! In preparation for the long weekend and the lovely month of May, I wanted to shine the spotlight on some salads that are great additions to a long weekend BBQ spread. I make a pretty good marinade and can babysit some meat on the grill, but usually I’m the person bringing the salad/side to a potluck. These are some of my fave salads to make and share with others, preferably outside and in the sunshine. I’m definitely not the first person to make salads like these, this is just a small collection of the salads that have become staples for me, my friends, and my family. Thinly slice cabbage, red pepper, and red onion. Arrange and drizzle with the dressing (half red wine vinegar, half olive oil, and a pinch of sugar). The small amount of sugar adds just enough sweetness to balance the bitterness of the cabbage. This salad is sweet, tangy, and fresh. It’s a great companion to some hot and spicy BBQ, or anything with some heat to it. 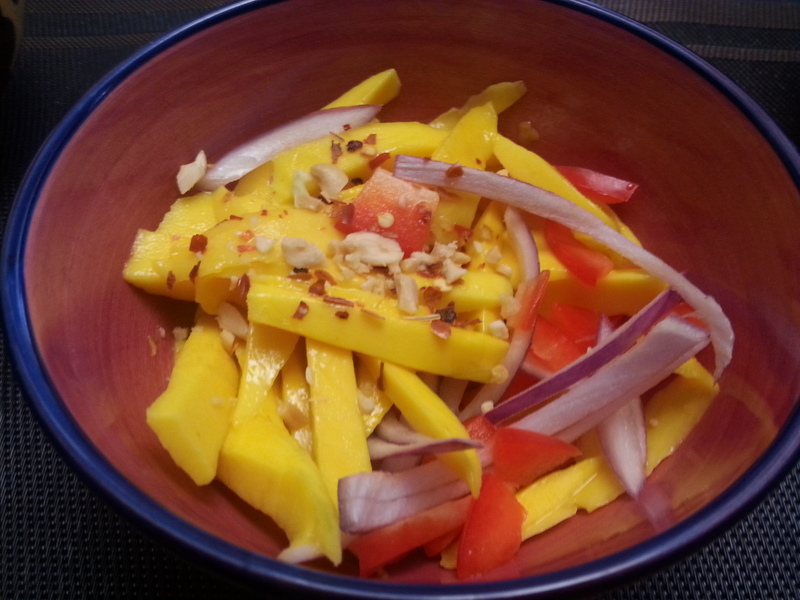 Thinly slice mango, red onion, and red pepper. Sprinkle crushed peanuts and chili pepper and drizzle lime juice. Don’t break the bank on pre-crushed peanuts, I just smashed a couple of whole roasted peanuts with the end of a knife (don’t cut yourself!). I also used an Ataulfo or honey mango, and I would highly recommend them if you see these Mexican mangoes at your local grocery. They are sweet and very delicious. This is another sweeter salad. 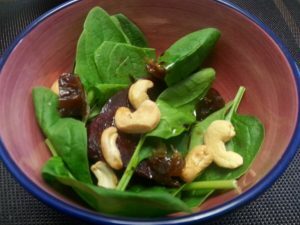 Top baby spinach with sliced beets. Pickled beets are sweeter but fresh beets are quite tasty as well. Add a few chopped pitted dates. Drizzle with a dressing composed of half balsamic and half olive oil. Top with roasted cashews. 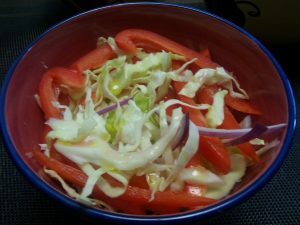 These salads are simple to prepare and can be adapted and added to depending on taste and what you enjoy. If you’re going to a potluck for the long weekend and don’t know what to bring, these are easy to prepare and travel-friendly. I hope everyone is enjoying the pleasant weather and that everyone is in good spirits, despite the crazy times we live in. Cheers to you! Enjoy a glass of your favourite summer beverage, and please treat yourself and others with kindness! You deserve it. This entry was posted in Journey with Germani. Bookmark the permalink.